I was doing the Raven Progressive Matrix test when I got stuck and couldn't solve 2 questions. Ps. The answer is marked in Green. Anyone could help me with any insights? The first one on the second row. 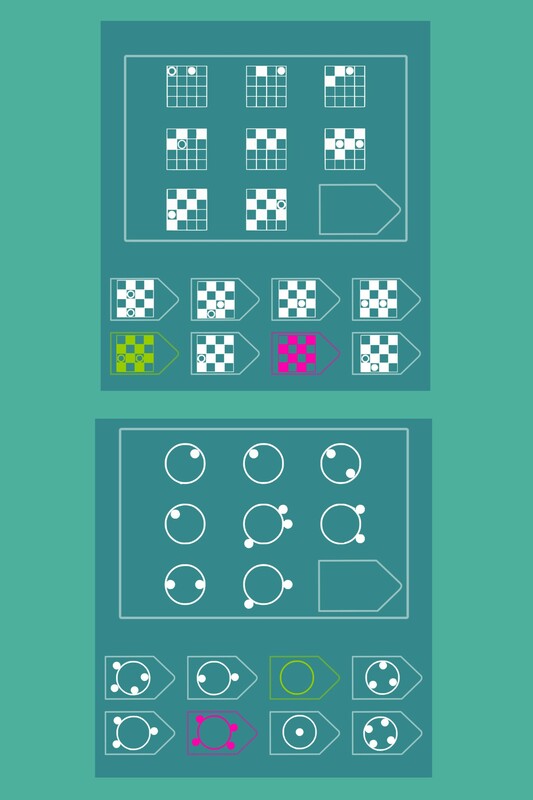 Each step, the dots move by one square to the right, wrapping back to the first square on the next row when they're at the end of the row. They alternate between full and not full whenever they pass through a white square. The third one on the first row. You can see it as an addition: dots inside the circle represent positive numbers, dots outside represent negative numbers (or vice-versa). The third item on each row is the sum of the first two. This rule also works vertically. Dots on the outside counter dots on the inside when added horizontally and vertically. Also only one kind of dot per circle (otherwise there are multiple answers - row 1, columns 1,2,3). Not the answer you're looking for? Browse other questions tagged pattern visual progressive-matrix or ask your own question.